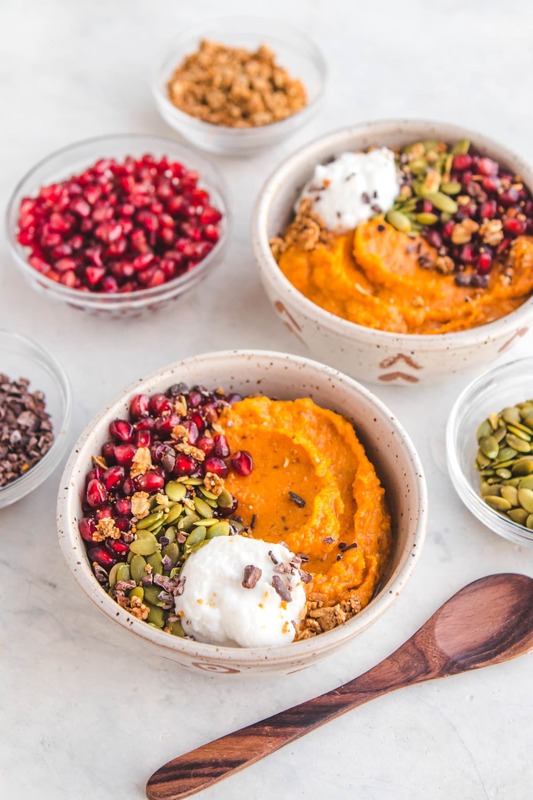 These Sweet Potato Breakfast Bowls are a healthy and hearty way to enjoy your morning meal! They’re also Vegan, Gluten Free, Sugar Free and Grain Free. What do you eat when it’s too cold for a smoothie, pancakes sound too complicated, and you’ve had oats for breakfast for way too many days in a row? 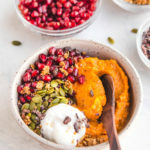 Fluffy Sweet Potato Breakfast Bowls, of course! 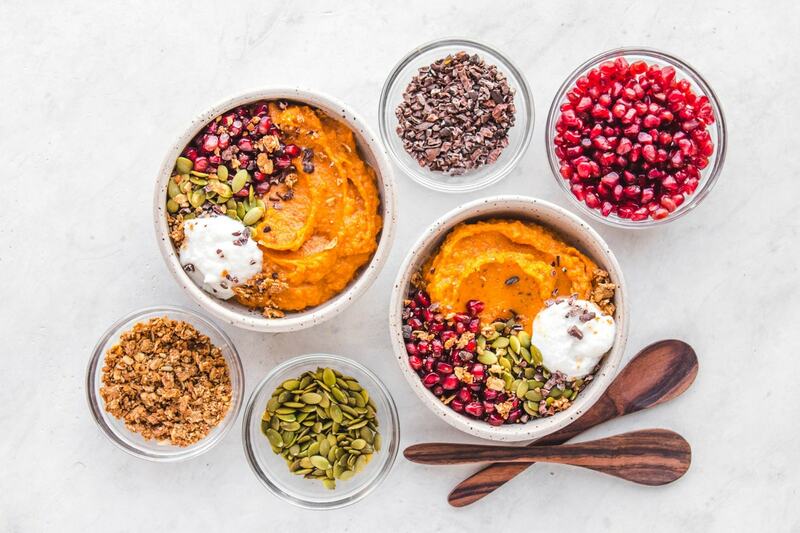 These Sweet Potato Bowls are kind of like a smoothie bowl…but warm! 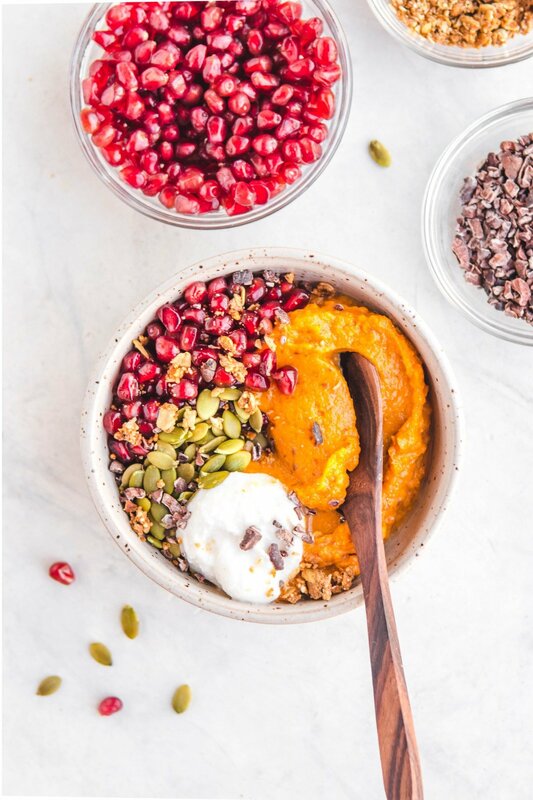 Think fluffy, caramel-y whipped Sweet Potatoes infused with Cinnamon and some healthy plant based fats, topped with some glorious crunchies like Pomegranate and Pumpkin Seeds. Are you drooling yet? Obviously you can top your bowls with whatever you would like, but I was trying to stick with the winter theme here. And I must say, the combination of Pomegranate, Pumpkin Seeds, Cacao Nibs, Coconut Yogurt, and Granola is very delish! 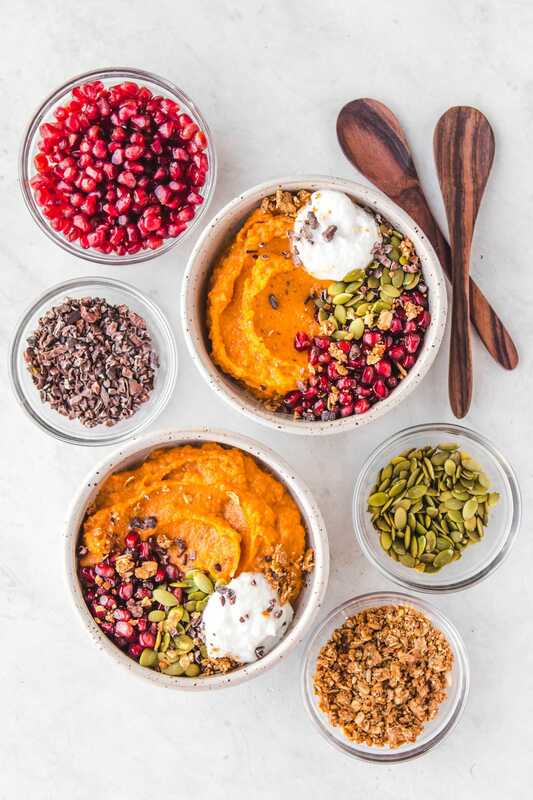 I would be remiss if I forgot to mention that these Sweet Potato Breakfast Bowls kinda taste like a healthy Sweet Potato Casserole. And who the heck wouldn’t want to eat that for breakfast?! Because we are roasting our Sweet Potatoes before we whip them into their fluffy final product, they’re already naturally sweet. I personally thought they were great on their own, and didn’t feel the need to add any extra sugar to them. So not only are they vegan, but they are also gluten free, grain free, and sugar free as well! To be honest, I don’t know if there are any more “free” labels out there that you’d even want to hit. So I’m going to stop my rambling, and get onto the good stuff (literally). These bowls can be enjoyed both warm and chilled, but I must say that I prefer them warm. If you heat them up in the microwave, the Sweet Potatoes won’t lose their moisture! Short on Sweet Potatoes? You can easily sub them for Pumpkin or Butternut Squash puree instead! Just keep in mind that squash will be less sweet, so you may need to add in 1-2 tbsp of sweetener. I would recommend Maple Syrup or Coconut Sugar. If you’re looking for more Vegan Breakfast recipes, you’ll also love these Pumpkin Spice Latte Overnight Oats or these Salted Caramel Apple Breakfast Bars! Preheat your oven to 400F. Wash your Sweet Potatoes, but do not peel them. Piece the Potatoes a few times with a knife, then place on a lined or greased baking tray and bake for 45-60 minutes, or until a “caramel” starts to ooze out of the pierced holes. (Note: If you have large Sweet Potatoes, I would recommend cutting them in half lengthwise and placing them cut side down on the baking tray to reduce cooking time). Remove the Sweet Potatoes from the oven, and carefully scoop our their flesh into a large bowl. Add in the Plant Milk, Ground Flax, Nut Butter, Vanilla, Cinnamon, and a pinch of Salt. “Cream” the mixture together using a handheld electric mixer on the lowest setting, for 60-90 seconds. Divide equally into two bowls, and top as desired. You can serve this recipe warm or chilled, but I much prefer it warm. Flax Seed may be substituted for Chia Seeds, or omitted. To make this recipe Nut Free, substitute the Nut Butter for Sunflower Butter or Tahini. PLEASE roast your Sweet Potatoes. If you cook them any other way, they will not be as soft or as sweet, and you will most likely have to add some liquid sweetener to the recipe. 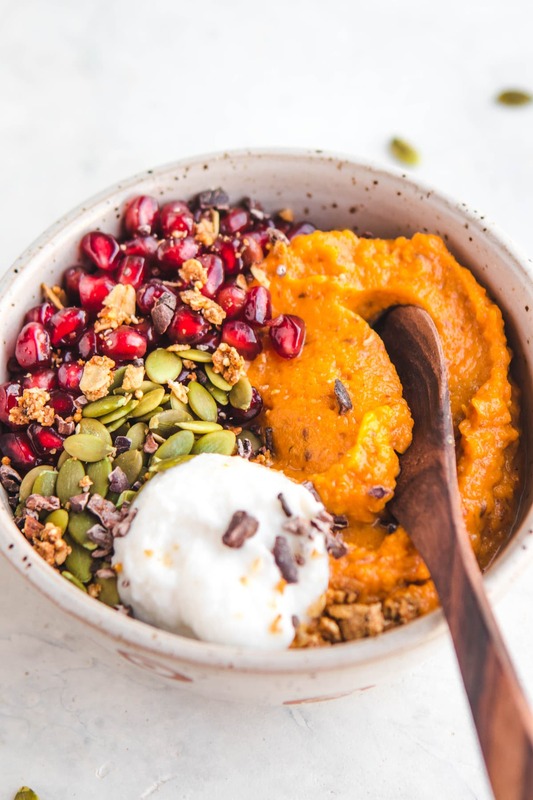 If you already have Sweet Potato puree and would like to use it in this recipe, I would recommend 2/3 cup per serving (so 1 1/3 cup for this recipe). This recipe could also be made in a blender, if you do not have an Electric Mixer. I just tried your sweet potato breakfast bowls this morning. Yummy!!!!! My new favourite breakfast bowl! So glad you enjoyed, Laura! What a fabulous idea! I always love plain baked sweet potatoes for breakfast, or really, anytime of the day! Mixing mashed sweet potatoes with sunflower seed butter or peanut butter is a favorite combination of mine. Of course, a lot of cinnamon and chia seeds are added on top! Beautiful pictures, I love the colors! This recipe seems sooo tasty. I’m not a huge fan of the taste of sweet potato (trying to like it though). After adding the nut butter, vanilla and cinnamon can you still taste a lot of the sweet potato or does it incorporate the other flavors? It will still taste like sweet potato 🙂 do you like butternut squash or pumpkin? you could use those instead! must to do lazy breakfast, thanks for saving my graduating year’s morings! I am Very excited about this! Awesome idea! Eating this as I write; this is a wonderful recipe! I halved the recipe, and with one yam, it only needed to be in the oven for half an hour. Creamy, fluffy texture and naturally sweet taste. Thank you for sharing this!! So glad you enjoyed it Rae! How many grams of sweet potato do you use? This tastes amazing with some crushed pecans + a pinch of nutmeg. Thank you for always having solid recipes! Could I do this with regular potatos? White? Where I live sweet potatos are VERY expensive and I but them rarely even though I really like them ? Hi Ewa, the recipe will not be sweet with regular potatoes. I would suggest using squash or pumpkin instead! Hi Caitlin! Love your recipes and videos, i’ve been watching for a long time! 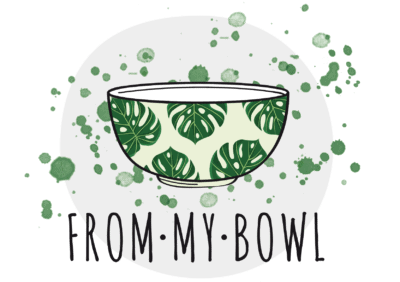 I’m thinking of switching from overnight oats to these bowls, but I usually meal prep the oats for the whole week since i’m a student. Would you suggest meal prepping these for the week? Made this bowl for breakfast this morning but with blueberries. Delicious! Ended up baking more sweet potatoes so I could make this for breakfast all week. This is incredible! I used tahini and chia instead of pb and flax – was still very yummy =) thanks for this awesome recipe! Just tried it this morining, and I LOVED it! it was so delicious, so easy to make, so flavorful, and finally something different lol Thank You So Much for this recipe Caitlin!! Yes – it should last for 5-6 days in the fridge! I absolutely LOVE your recipes!!! It’s so creative and fun. I have been scrolling through a lot of your recipes and CAN NOT GET ENOUGH. Although you recommended roasting the sweet potatoes a couple of times, I had steamed potatoes ready to go so I tried the recipe expecting it to be just alright since I didn’t follow your recommendations. That being said, it was surprisingly tasty! Thank you for this recipe! I’ll caramelize the sweet potatoes next time, but I’m already very impressed by this recipe. I tossed the ingredients into my blender, 10 seconds later it was ready to go. From there, I put some toppings on it and it was amazing. I can’t wait to try the caramelized version! How did you get yours to stay so orange looking? I followed the recipe to a tee and mine looked tan colored instead of orange. Maybe it is the type of Sweet Potatoes you are using! I definitely notice a difference in quality in organic vs. non-organic. Also, the color may have dulled some from the Cinnamon! How do you think it will hold up made a day or two before and re-heated in a frying pan or pot (while camping)? They should be fine! You will need to keep the mixture cold, however. If it thickens up too much for your liking, you can thin it out a bit with some non-dairy milk or water. This recipe looks incredible. Can’t wait to make it! Odd question, though—do you remember where you bought those bowls in the photos? They are adorable. They were a Christmas gift unfortunately, but they were handmade! This recipe is absolutely AMAZING! It tastes so decadent and comforting, and I love that it only uses healthy ingredients. You continue to awe me with your work. Thank you so much! Hey thanks for this idea! I go grocery shopping every other week and I was on my second week with no breakfast options in sight, until I saw this recipe! It was so yummy and easy to make! And you are right, roasting the potatoes DOES make a difference 😋. I topped mine with some nice tart blueberries.